The genre of Prog Rock seems to be the exclusive playing ground of Steven Wilson (and his various bands) and bands that are signed on the Kscope recording label, such as Pineapple Thief and Anathema. 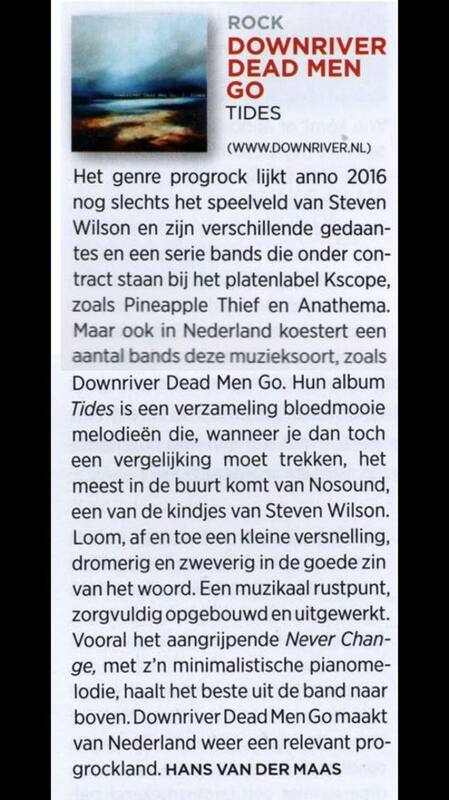 Yet, in the Netherlands a number of bands adhere to this genre as well, such as Downriver Dead Men Go. Their album Tides is a collection of stunning melodies that, if you would like to make a comparison, comes close to Nosound (one of Steven Wilson’s pet projects). Languid, with sometimes an acceleration, dreamy, and highbrowed in the positive sense of the word. A musical fulcrum that is carefully structured and worked out. In particular, the moving Never Change, with minimalistic piano melodies, brings out the best of the band. 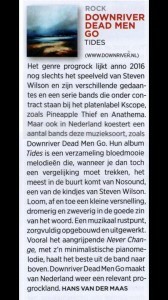 Downriver Dead Men Go restates the Netherlands as an important prog rock country.